[04:04:42] <cradek> well I figured out why the HNC won't run a G00. there is no such gcode. [04:13:52] <stustev> I firmly believe EMC2 will run either of your machines! [04:14:23] <cradek> I bet you are right. [04:14:37] <cradek> I'm sure the lathe will get it. [04:14:48] <toastyde1th> cradek: does the present lathe control have roughing cycles? [04:15:54] <cradek> it's amazing that they ever worked. [04:16:14] <toastyde1th> and that people managed to debug them? [04:17:44] <toastyde1th> take pics, ha. [04:20:39] <cradek> my mill is 'new' - from 83. it needed some repair but runs pretty well. it has a serial port so it's easier to use than this thing. [04:21:33] <cradek> huh. the 60s were a long time ago. [04:22:30] <toastyde1th> series 2 bport? [04:23:01] <stustev> do you have pictures of the lathe posted anywhere? [04:23:04] <cradek> I have not needed a bigger table yet. I'm surprised but it has always been enough. sometimes only barely. [04:23:14] <cradek> stustev: not yet. I should do that. [04:23:54] <stustev> I was thinking of the tooling? What kind of tooling does it use? [04:24:22] <toastyde1th> i'd be suprised if it took anything but standard lathe tools? [04:25:13] <stustev> does it have an area to 'gang' mount some adapters on the cross slide? [04:25:23] <toastyde1th> is there a four bolt hole pattern? [04:25:27] <toastyde1th> on each face of the turret? [04:26:11] <toastyde1th> hahaha you have an hnc? [04:28:51] <cradek> that would be smart. I should mount up some jacobs chucks. [04:33:28] <cradek> I know I know! [04:33:36] <cradek> and it will. but there are a lot of things to sort out. [04:36:02] <stustev> yes - I don't know how many he is making on this run. I ordered 10. I won't need all 10 immediately. [04:37:00] <cradek> 10 is a lot but you could go through them fast - just a couple machines. [04:37:31] <cradek> I'm thinking about ordering a third for the spindle resolver instead of buying and mounting an encoder. I'll see how they work first. [04:39:13] <cradek> I think he was testing a prototype at workshop but I didn't see it. I wish I had seen the setup and test results. 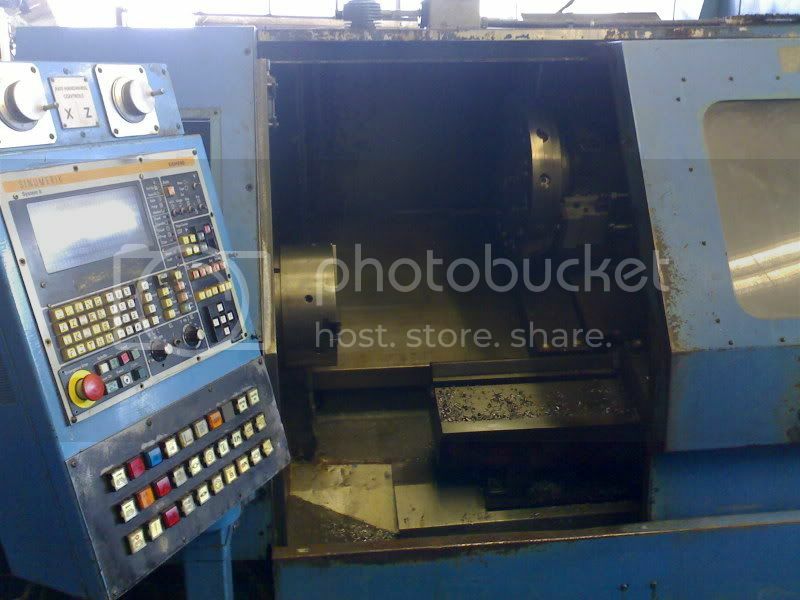 [04:40:00] <cradek> their lathe is actually pretty nice. I like it for small stuff. [04:40:13] <cradek> but the hnc will be better I think. [04:41:22] <stustev> He didn't have a prototype at the workshop. He hooked up the AD test board. It has the same chip he is using. The response was very fast. Halscope showed virtually no difference or delay. [04:42:59] <cradek> no, but possibly more useful! [04:43:31] <cradek> how is cinci? [04:44:28] <stustev> I wasn't at the shop much today. I don't know what they got done. Yesterday it wasn't going together yet. I will find out tomorrow. [04:52:27] <stustev> pick up and get the speed directly from the spindle. I don't think I will need that as I will know how fast the spindle is going at all times anyway. [04:54:11] <cradek> the code does not do that right now, but I would fix it for you if your machine would do it. [04:57:40] <stustev> I was reading some of the posts on CNCZone. Maybe the Mach boys would be impressed with rigid tapping on that old machine. [04:59:53] <stustev> mach will not index home? [05:01:10] <stustev> wow - all the pretty stuff on the screen - sounds like all fluff and no stuff - in Texas they call that 'all hat and no cattle'. [05:03:42] <cradek> in your shop what use would a pocketing wizard or hole circle wizard be? but on a hobby stepper machine what use would index homing be? [14:26:16] <Guest258> Anyone out there? [14:27:26] <skunkworks_> * skunkworks_ samco. [14:28:21] <Guest258> does this keep histyr? [14:32:31] <cradek> are you having trouble with the mailing lists? [14:33:21] <skunkworks_> also - someone had done a puppy linux emc2 build. But it is pretty old. [14:33:25] <Guest258> Ok, ill do that. Originally I could send emails, but now they all bounce saying they are treated as spam. [14:34:00] <cradek> maybe there is more specific information than that. put a bounce on pastebin so we can see it. [14:35:15] <Guest258> pastebin? you mean copy and paste the email here? [14:35:36] <cradek> go to http://www.pastebin.ca and paste it there, then put the URL it gives you here for us to see. [14:37:54] <cradek> sometimes they have more than one mail address and they forget which one they used originally. [14:38:06] <cradek> ok, well with more information maybe someone can help you. [14:39:39] <cradek> ok, I bet there is a detail you are missing. I'll help later then. [14:47:46] <skunkworks_> yah - I am the IT so... There is a fuzzy line between what is work and what isn't. But I really should start using the email from my website. [14:49:41] <skunkworks_> a good 100000 saved emails and counting. [14:52:13] <SWPadnos> remember when a microprocessor was a huge 64-pin DIP? [14:56:28] <skunkworks_> I ment big..
[14:58:28] <SWPadnos> did you ever see the specs for the Z80000 ? [16:25:05] <jepler> yes. Program G64 P- where P is the "tolerance value". [16:27:42] <cradek> jepler's answer is right. you are seeing internal corner rounding and you can control the tolerance with G64 P.
[16:27:57] <skunkworks_> your machine accelleration is probably low. [16:45:04] <owad> for the X axis when I click '+', should it go right or left? [16:46:12] <owad> ah -- that's where I got confused last time. You're talking about the table moving and I was thinking about the head moving. [16:48:21] <jepler> if you are using axis, the coordinate origin shows which way each "positive axis" is compared to the work. [16:51:26] <owad> When the Z axis is all the way up, should that be the zero position, or should the 0 position be when it's all the way down? [17:09:54] <archivist_emc> 4mm od worm 6 turns helix angle about 21 deg is a flimsy thing to mill ! [17:50:44] <tomp> most web references talk about right hand rules for cnc. so i didnt find a nicer pic. [17:50:48] <tomp> ﻿﻿but i came across this for the cnc/math/programmers here http://www.me.uvic.ca/~mly/PM.pdf "TRIANGULATION-BASED INTELLIGENT CNC MACHINING OF INTRICATE COMPOUND CURVATURE SURFACES"
[17:55:06] <tomp> BigJohnT: it's "the bird"
[18:06:00] <owad> I have my Z axis homing correctly, now. But when it finishes, it sets its location to 0.4656. [18:06:03] <owad> I have home loc = 0.0, table travel = -4.5 to 0.0, home switch loc = 0.25, and home search vel = 0.05. I don't see anything in there that's anything like 0.4656...? [18:08:07] <owad> that did it. thanks! [18:42:42] <SWPadnos> do you have any documentation on how active tooling is programmed (in G-code)? [18:47:48] <colinb> classic ladder ? [18:48:55] <colinb> so id just set M1xx to run whatever script to call a hal IO ? [18:50:11] <SWPadnos> that script could contain a command like `halcmd sets LiveToolingEnable 1`, assuming you have a signal you've cleverly called "LiveToolingEnable"
[18:51:25] <colinb> how would i deal with tool changing then ? [18:51:53] <colinb> so emc would know that things are in place ? [18:52:50] <cradek> you could just have it come on when you load the tool. [18:53:13] <SWPadnos> oh, is it run from the same motor as the spindle? [19:13:24] <tomp> nm not needed, hp maybe? or phys size? [19:13:40] <tomp> or 'bigass' ;) ? [19:13:44] <colinb> ill get pics tommorow if that helps ? [19:15:57] <colinb> why are the motors of importance if you dont mind me asking ? [19:16:13] <tomp> right, MMK uses similar system, a worm driven by servo motor, i wondered about huge power requirement, the rocker is only 20" sqr, the rotary is only 16" dia. [19:18:28] <colinb> well it would depend what gearing was used on that table no ? 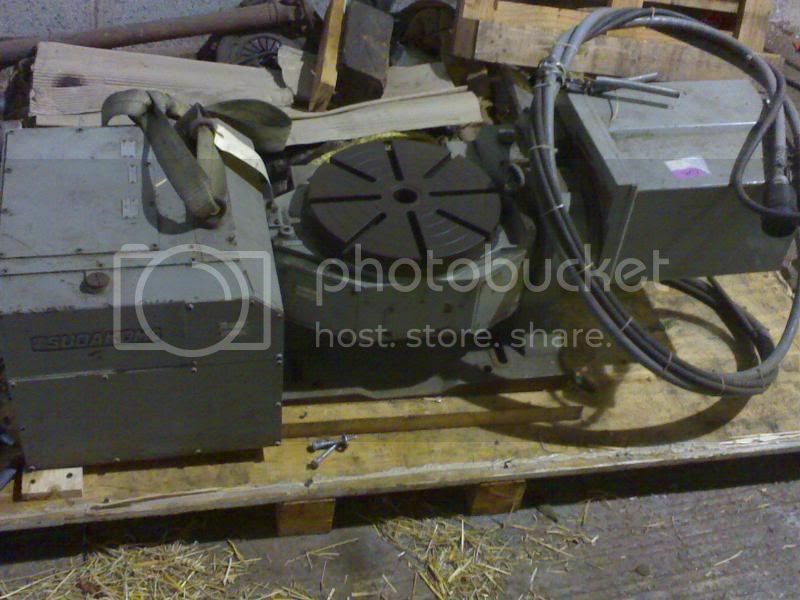 [19:24:00] <cradek> anyone need a 12" tilting rotary? it's new in the crate, worms both ways so could be good for cncing. [19:24:25] <colinb> got any pics ? [19:25:54] <tomp> did you feel the motion? [19:26:35] <cradek> the tilt has less resolution and more backlash than the rotate I think. but you could always tilt it just one way and not worry about it. [20:12:47] <cradek> jepler: inexorable march of progress? [20:12:59] <jepler> cradek: unavoidable change over time? [20:15:01] <jepler> "if you spoke to technical [gecko foot makes word illegible] and they referenced [sic] a file, chances are it is here." [20:15:04] <robin_sz> and is that flash? [20:15:28] <robin_sz> isnt it just xhtml and layers? [20:15:54] <robin_sz> not a huge problem is it? [20:17:06] <jepler> SWPadnos: there is a very fragile way to run the proprietary 32-bit flash plugin in 64-bit firefox on linux, but after awhile it crashes and won't work again until I restart firefox. [20:19:47] <SWPadnos> rack server, isn't it? [20:20:12] <robin_sz> 2 x 2ghz xeon, RAID enabled, 4gb of ram, 2 x hot swap PSU, 2 U rack mount ..
[20:20:38] <SWPadnos> so that's like $500, right? [20:25:01] <robin_sz> so this dell optiplex would be OK? [20:25:06] <cradek> SWPadnos: do you know if the 7i33t still comes without those screw terminals? [20:28:51] <cradek> can I use 7i33 + 2x 7i37 with the new hostmot2 driver? [20:29:59] <SWPadnos> wait, the 7i37 is the I/O card, 7i33 is the motor card? [20:32:02] <cradek> 5i20 has 3 connectors right? [20:38:13] <cradek> whee! "we have everything here. it will be shipped out today." [20:39:15] <cradek> you will win. I asked for ground shipping. [20:39:30] <cradek> oh you're uk? I'll win. [20:55:19] <colinb> where bouts in the UK are ya ? [20:56:17] <robin_sz> you in the UK? [20:58:07] <robin_sz> need I say more? [21:06:25] <robin_sz> and ot doesnt have a workign control? [21:09:24] <robin_sz> what lathe is it you have? [21:10:38] <robin_sz> and the sinumerik is broken? [21:12:56] <robin_sz> big ac drive? [21:14:50] <robin_sz> would that work as a servo drive? [21:15:19] <robin_sz> you tried the usual tricks? [21:15:29] <colinb> baseball bat ? [21:30:03] <jepler> SWPadnos: or in your ladder program defer the prep steps until load, even though emc provides both signals..
[21:33:04] <robin_sz> does the config file still need magic numbers to switch from mm to inch? [21:33:36] <colinb> cant we just abandon inches already ? [21:34:13] <SWPadnos> is that the correct link? [21:39:37] <robin_sz> but I just call it ".1"
[21:41:29] <jepler> 13/64 .. is that more or less than 3/8? I can't be bothered to figure that out..
[22:55:17] <Guest430> Can EMC be run in DSL (Damn Small linux)? is there a pre installed version out there? [23:12:20] <tomp> ﻿if anyone gets a socket 775 mobo, be very very very careful, the cpu is like a bga, but the socket it actually pins sticking up. teeny bent pins meant to smash seat on the ball grid. i fortunately was able to repair 1 bent hairpin. [23:15:25] <robin_sz> am I right in thinking that running servos with a mesa card will be less demanding of the real time stuff than rying to do steppers? [23:16:15] <robin_sz> slower rates, not so troublesome if the latnecy wobbles about a bit? [23:18:14] <skunkworks> if you don't need anything else fast.. THen yes - 1ms/.5ms is a lot less taxing then 30us. [23:19:02] <tomp> i think robin_sz is right, but its a matter of magnitude. meaning a bad enough report from latency test is bad even for servos. i do not know where the bounds are for servos.